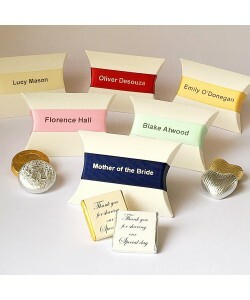 Personalise these lovely 2 Choc or Pillow Place Settings with your individual guest names - a wonderful chocolate filled favour gift and a table place setting in one! Sealed with a double faced satin ribbon with foil printed text. *A huge variety of ribbon colours available - please enquire. Click to view a selection of ribbon colours, chocolate fillings and to order your Place Settings.